The chart below shows the changes within the last 30 days in the number units of Laipac S-911 device type are connected to Wialon Data Center. 1 units of Laipac S-911 device type are connected to Wialon Data Center. This represents 0% of all Personal trackers connected. 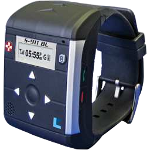 Laipac S-911 personal tracker is often sold by Laipac locked to be used only with Laipac GPS tracking software.